Leadership perspectives on 4 dimensions of Herman Miller’s ambition to create a better world around it’s customers and communities. 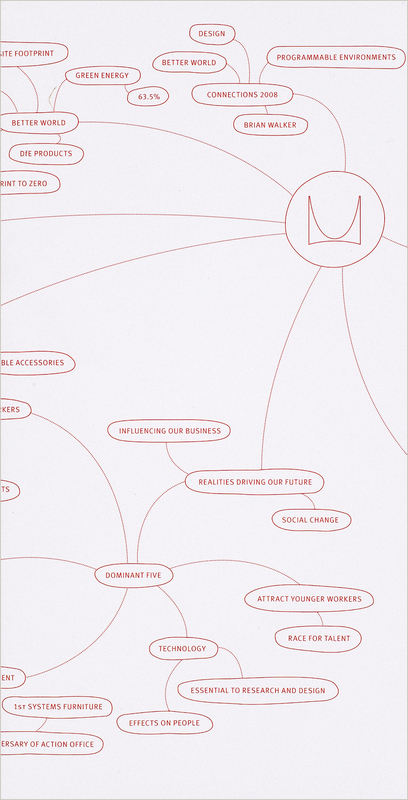 The illustration on the covers and inside back cover shows the complexity of connecting the Herman Miller community. Size W 6" x H 11.75"
Paper/Material Uncoated recycled white cover and text. Uncoated gray text. Techniques Offset printing, 4 color process plus 1 spot color. Covers double gate fold and embossed. Perfect binding.